“It’s like putting Americans and Africans together. They can’t study together with such huge mental differences,” an ultra-Orthodox Jewish parent said when explaining why he cannot allow his daughters to share a classroom with Sephardi Jewish girls. It’s hard to countenance the concept of a “demographic threat” and treat it as socially acceptable without also opening the door to other forms of bigotry that a liberal Zionist cannot possibly tolerate. This is the dilemma many Israelis now face: How do you justify the idea that the rights of a non-Jewish minority can be restricted (this being a practical necessity if Israel is to remain a Jewish state), and then stand up in defense of religious and racial pluralism when ultra-Orthodox Jews insist that the “purity” of their children will be tainted if they are forced to share classrooms with Sephardi Jews? 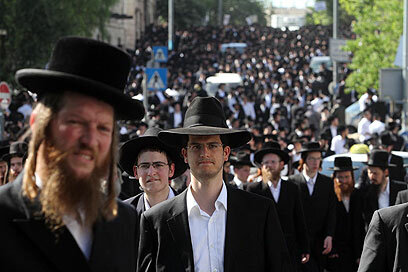 Today, as 100,000 ultra-Orthodox Jews protested in Jerusalem in support of segregation, many Israelis probably feel conflicted about which particular demographic threat now poses the greatest danger to Israel. The Ashkenazi students of the ultra-Orthodox Beit Yaakov girls’ school in [the West Bank settlement] Immanuel stayed home on Wednesday, yet again, as part of an organized protest against the decision by the Education Ministry and High Court to end the segregation between Sephardi and Ashkenazi students. “No court ruling or Education Ministry decision can bring the two groups together,” an Immanuel resident said Wednesday. “It’s like putting Americans and Africans together. They can’t study together with such huge mental differences,” he said. Some 70 Ashkenazi students of the Beit Yaakov girls’ school stopped attending classes two days before the Hanukkah holiday – in protest of the ministry’s efforts to force the ultra-Orthodox school to rescind the segregation, in keeping with the High Court ruling. Sami Michael, an Israeli author who grew up in Baghdad and settled in Israel in 1949 when he was 23, notes that even in the darkest days in Iraq, Egypt and Lebanon, they never separated Jews from Muslims and Christians in schools. My nerves are tingling and my flesh is crawling as I write these lines. This is a small story about two girls attending the same school who became friends and who are now required, by racist order, to wear school uniforms of different colors. They have been forbidden to come in contact with each other and in order to make the prohibition concrete, a fence covered with an opaque cloth has been stretched between them. They preserve their friendship by passing notes through a hole in the fence. This story did not happen in the days of apartheid South Africa or in the dark times before the civil rights movement in the United States or in a ghetto in an insane Europe during World War II. The two schoolgirls wearing uniforms of different colors are Jewish girls from the Israeli settlement of Immanuel in the West Bank, which is flourishing under the flag and armed protection of the Israel Defense Forces. The school also receives funding courtesy of the Israeli taxpayer. The two schoolgirls’ crime is their different ethnic origins. One is an Ashkenazi Jew, whose family’s roots are in Europe, and her friend is a Mizrahi Jew, whose family comes from Middle Eastern and North African countries. Was it for this that the state of Israel forged its path through rivers of the blood of its sons and its enemies? Even in the darkest days in Iraq, Egypt and Lebanon, they never separated Jews from Muslims and Christians in schools. One of the initiators of the segregation in Immanuel commented: “This isn’t ethnic separation, but rather religious.” He was right, but only partially. Indeed, this separation is not ethnic but rather “racist,” a word rarely used, even by those of courageous and honest determination. To my regret, intellectuals whose voice resounds from time to time from here and abroad have sealed their lips. They and the vast majority of Israeli society used to think of “discrimination” as something unclean. What? Here? In our enlightened country? Let us imagine for a moment a school, say in Germany or Britain, which puts up a separation fence for “religious” reasons, as the Immanuel racists claimed, and compels the Jewish students to wear a uniform of a different color. What a ruckus we would be raising! I have personally met the current head of the Jewish community in Tehran and I have conversed with many Iranian expatriates in Europe and the United States. I am also in touch with combative elements in Iran. I can attest that Jewish schoolchildren and students living in Iran today are not required to wear clothing of a different color. How has it happened that rabbis, at least in Immanuel, are even more benighted than the ayatollahs we excoriate and abominate day and night? And why have the intellectuals here mostly disappeared? The Zionists have made their bed and now must lie in it. Their beliefs are founded upon exclusion, on being chosen or not, on being orthodox or not — this is what they wanted. If it destroys the peace and security of the state it is the destructive force they have chosen. The problems exist not despite the strength of their beliefs but because of them. Racism is cultivated in Israel since its founding in 1948. There is a logical development inside this society, built on the ethnic cleansing of the palestinian inhabitants and its fierce negation. No wonder that the society’s coherence express the same symptoms of intolerance and hate preached continually since 1948 by its lawless leaders. The wall is the segregation’s best expression. Israel is today the quintessence of human negation. Its covert agents are running all over the world hurting humanity, especially in its simplest and dignified expression (Mavi Marmara). The orthodox Jews that lived in Palestine before 1947 opposed the formation of a State of Israel because they correctly foresaw that it would be a secular state with lip-service to religion. You TOTALLY misreported and distorted this story. It’s not a racial issue at all. There are strictly observant Sephardic girls in the same classrooms as Askenazek (European) girls! This is strictly an issue of religious freedom NOT “race.” The Ashkenazek parents don’t want their religiously observant girls influenced by girls who do not come from strickly observant homes, as is the case with some of the Sephartic girls. It was bound to happen sooner or later. 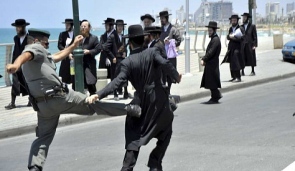 Just have a look at how the Ashekanzis treat the other Jews – be it that they are the Russians, Sephardim, Aethiopians or the newly converted Peruvian “Jews”. And I don’t even want to address the plight of the non-Jewish workers from the sub-continent and the Philippines or even – God forbid! – the Israeli Christian and Muslim Arabs! Its a truly democratic state for the Ashkenazim Jews (converts themselves) and the rest is divided into 2nd, 3rd and 4th class citizens – and the sub-humans called Pali. Or, according to their schoolbooks, the inferior Arabs.